Thomas Jefferson was president of the USA from 1801 to 1809. He died broke. He sold his books to the Library of Congress and his friends organised a lottery to sell part of his lands, but that was not enough. He died a widower on July 4, which was the 50th anniversary day of the Declaration of Independence. Jefferson's last words were, “Is it the Fourth? I resign my sprit to God, my daughter and my country.” His epitaph reads: “Here was buried Thomas Jefferson, author of the Declaration of Independence, of the Statute of Virginia for Religious Freedom, and the father of the University of Virginia.” The epitaph, however, did not include “President of the United States” obviously because he was the president by the choice of the people and it was not considered at all his achievement. This is one among numerous instances for which democracy in USA did not face any obstacle so long. Yet, a question crops up due to recent scenario in USA whether presidential system in USA has reached the end point. Then comes the similar question due to recent scenario in Bangladesh whether parliamentary system has reached the end point. The answer will be yes if we do not accept the statement that though in a democratic State every citizen would participate in public administration, but nowadays the States are so much larger territorially and so numerous in population that the practice is impossible. This problem of people's participation was somehow solved until now with the device of the representative government. It is based on doctrine of delegation of power. Sovereignty belongs to the people so they can surrender it to their single representative or a group of representatives. Then he or they rule on the authority of the metaphysical general will, which however in practice supercedes all individual wills. Representative government, being conditional on the delegation of power, is a negation of democracy. At best it can be said that it is a government for the people, but government of the people and by the people is only possible in direct democracy. With the system of representative government political parties formed by self-selected leaders rise to usurp individual sovereignty and thus the party system eclipses the former. Under representative system, government is theoretically controlled by the people, at least indirectly through the parliament. But under the party system government is controlled by the party in power and responsible only to it. To get the control of government parties must have a parliamentary majority and for that all means are adopted. 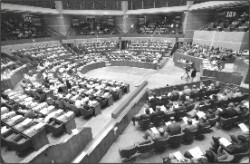 A committee of only a few members of a party selects the candidates in the election for the members of parliament. Political practice under party system discards morality and its sole purpose becomes lust for power, sectional selfishness and class hatred. Even nominal democracy in this process disappears justifying dictatorship of one form or another. “59(1) Local government in every administrative unit of the Republic shall be entrusted to bodies, composed of persons elected in accordance with law. (2) Everybody such as referred to in clause (1) shall, subject to this Constitution and any other law, perform within the appropriate administrative unit such functions as shall be prescribed by Act of Parliament, which may include functions relating to - (a) administration and the work of public officers; (b) the maintenance of public order; (c) the preparation and implementation of plans relating to public services and economic development. Article 152 says 'Administrative unit' means a district or other area designated by law for the purposes of article 59. Therefore, there is no logic why one would not agree that partycracy and its follow-up, the dictatorship, have engulfed the parliamentary system and consequently we have a non-party caretaker government which is not within the normal framework as in the Constitution, but as the people wished. Consequently this government is required to transfer first the administrative power to the people through Articles 59 and 60 and only then to the Parliament. The writers is retired Judge, Appellate Division, Bangladesh Supreme Court.